Well, the huge crowds have come back down the Col de Steroids, the last of the metal barriers have been put back on the flatbeds, the kilometre markers have been deflated and the Municipal litter pickers are out under arc lights on overtime - oops, sorry, that's the Stamford to Scunthorpe stage of the Tour de France (took a wrong turn there somewhere, boys). This year's Coast to Coast was the biggest entry yet with 40 masochists volunteering for the suggested punishment. There were some regulars: Martin and Sharon Wikner, who last year made the crossing as part of Martin's End-to-End Run, were back, both this time on 1972 Puch Maxis. John Bailey was present and correct on a Honda Express with the clockwork starting mechanism. The irrepressible Frank Brzeski was powering-on on a Power-Pak. Andrew Pattle was succeeding for the third or fourth year in a row to cross without any major traumas. From the organisers: Stephen Smith and Sheila Brown were cheating on a couple of almost new Piaggio Zips while Chairman Casper cocked a snook at the whole notion of cyclemotoring by riding his absolutely delicious Honda Dream 50 (a double overheard cam shopper's bike). "...the irrepressible Frank Brzeski powering-on on a Power-Pak." b.) The number of new suckers, I mean participants, who had been attracted to the run. David had introduced a team element. Teams included 'Duff' (not sure whether this referred to Homer Simpson's favourite beverage, the state of the machines or the mental abilities of the riders. In the latter case it should surely have been 'Duffers'), Black Widows (all of whom were Caucasian men), the Shires, the Shroppies, two Last of the Summer Wine groups (obviously devotees of cable TV), Blue Max and the mysterious 'Zubi-Ondo'. In addition the Sports Moped Club started with the run on the Saturday morning doing a two-way dash that took them to Whitehaven and back to Hartlepool over the weekend. As Dean Fielder, owner of Fielder's Motorcycles in Goole, a very honest man, said, the Fantic of brother Brent and the Garelli of their companion Paul Simcox were extremely presentable. This was in marked contrast to his own Yamaha. As the motor cycle mechanic of the group it was inevitable that his bike would look like it had been ridden and maintained by a thirteen year old with behavioural difficulties before being buried in a storm drain for twelve months. Actually that's an exaggeration, it didn't really look like it had been under water for more than six weeks. Anyway the three machines were spotted going eastwards on Sunday morning at a very respectable pace. Heroes included John Hughes who, snappily dressed in fresh breeches, broke one Cyclemaster at the starting car park and then proceeded to cannibalise it en route to keep a second running. His friend Myra cheerfully carried the sacrificial Cyclemaster round on the back of the car and, as enthusiasm took its hold, was to be found on the second day grovelling in the dust besides John wrestling with blackened segments of mechanical inadequacy. Gareth Clark inexorably wound up in Whitehaven on the VéloSoleX, while Frank insisted on taking a couple of detours to make the 70 miles a day more of a challenge. Peter Morton rode the first day on an American built, one might almost say 'home-built', Honda 35cc industrial-engined mountain bike. There were two notable features, firstly, although the set up appeared rather crude, under power the bike fairly steamed along and would climb hills and secondly, because it was so easy to ride, Peter insisted on riding it the first 50 miles or so with the engine turned off. We were a little short on lady riders this year with the third of the trio being Joyce Downing of Telford who shared a 1978 Mobylette Majorette with Alan Redgrave. The Maths Adviser, incidentally, who usually graces the run with her presence, had broken an arm and a leg in a tumble off her Piaggio Zip. Fortunately, while she spent a fortnight in hospital, the bike was hardly scratched and was ridden in the event by her son. We wish her a speedy recovery. Most popular machine of the traverse was the New Hudson autocycle in all three forms, with Junior de-luxe engine, with "straight-frame" and the later Villiers 2F engine and with the 'S' frame. The rumour was that the group of four who travelled together had been sponsored by the North Pennine Tourist Board to provide grockle interest. 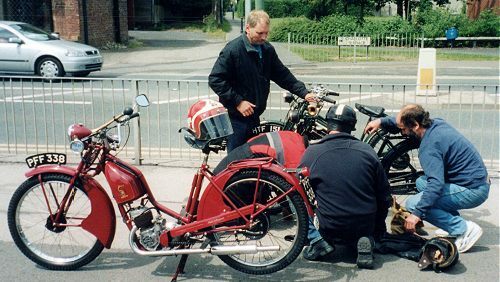 Every twenty miles or so they would dismantle the oldest machine, a 1947 model belonging to Andrew Speak, whether it needed it or not, and then form a perfect tableaux by the roadside entitled "endearing local characters service their spavined steeds". Passing motorists would hoot and wave and weakened by the nostalgia for traditional values awakened in their cholesterol infested hearts proceed to the nearest visitor centre to buy sacks full of knitted souvenir items possessing all the stylistic glee of a Cumberland sausage. "...endearing local characters service their spavined steeds." Marcus Allard nearly became the first person to do the run on a suitably elderly and under-powered mini-scooter. He assured me that by 1966, when his bike was produced, it was no longer called a Triumph Tina. Reflecting Harold Wilson's "white heat of technology" speech the Coventry Company had dropped names in favour of simple initials and numbers. The Thunderbird became the T100 and would do the ton. The Bonneville became the T120 with a top speed of... you're getting the hang of this aren't you? And the Triumph Tina became the T10 with a top speed of... The Tina left its ungrateful owner stranded by Bassenthwaite Lake and served him right. Rob Brown blatantly cheated on a BSA Bantam which started first kick and ran well both days. Someone lend that man a clutchless RM1 for next year. 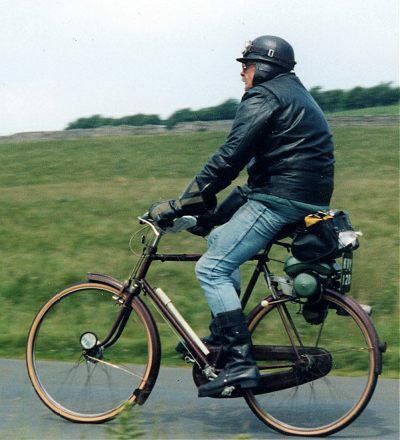 Perhaps the most interesting and unusual bike was the 1962 HMW Supersport ridden by Richard Hanson. He was, however, consistently rude about it and was lucky it didn't dump him by the side of Bassenthwaite Lake to join the hapless Marcus. David had asked me to present a 'team prize', but when you come down to it, it's difficult to differentiate between teams. Prizes therefore went to the riders of the three feeblest machines to complete the run: John Hughes (Cyclemaster), Gareth Clark (VéloSoleX 3800) and Frank Brzeski (Power Pak). Peter Morton had ridden back to the North East on the Sunday morning. The fourth bottle of beer went to Marcus Allard because he was going to be the first person to etc. By the time he arrived towing the Tina on a trailer other potential prize-winners had disappeared so he got the award anyway for being a thoroughly good egg, a fantastic tryer, being made of the right stuff and just generally doing that very British thing - FAILING. David Casper and I would like to thank everyone for coming along, including Karl Heim who followed the route in his magnificent 1929 Model A Ford. At Whitehaven as the successful entrants drifted in looking a little weary and drawn, a small group gathered assuring us they would see us again next year. A plaintive voice from the back muttered "You'll never see me again, I'm going to scrap it!" That is not the spirit that built the British Empire or the All-Aluminium Automatic No-Smoke One Handed Picnic Egg Poacher (Patent Pending). See all of you again next year, including you snivelling at the back. You know who you are.